We had a nice jag of smaller yellowtail and rainbow runners...close cousin to yellowtail...this week like the one held here by our amigo, Leonard Bishop. The fish are great on light tackle and great eating. Hopefully, some of the larger yellowtail will pop up soon! Emily Duncan from Santa Barbara usually outfishes dad when she comes to visit and shows off the type of sierra we were getting this week. Pretty typical for this time of year. The sharp-toothed speedsters can come in packs! A crazy mixed week of weather and fishing down here. Some days windy and other days nice, flat and sunny. Thankfully, the wet stuff that hit the West Coast of the U.S. this week didn’t make it down, but we still got winds. Talk about a crazy week of fishing, we got warm water species like dorado, bonito and even had a marlin hookup, but at the same time…same days…and sometimes even the same panga, we got pargo, snapper, cabrilla (seabass) and even some smaller yellowtail and rainbow runners…all coldwater fish. That’s kind of encouraging to hear about the yellowtail and rainbow runners. I’ve been getting alot of inquiries asking when the yellowtail will show up. I wish I had a crystal ball, but it really all just depends on the water temperatures. The best time is usually about Feb. or March to start and then through May. Again, it just depends on the water. 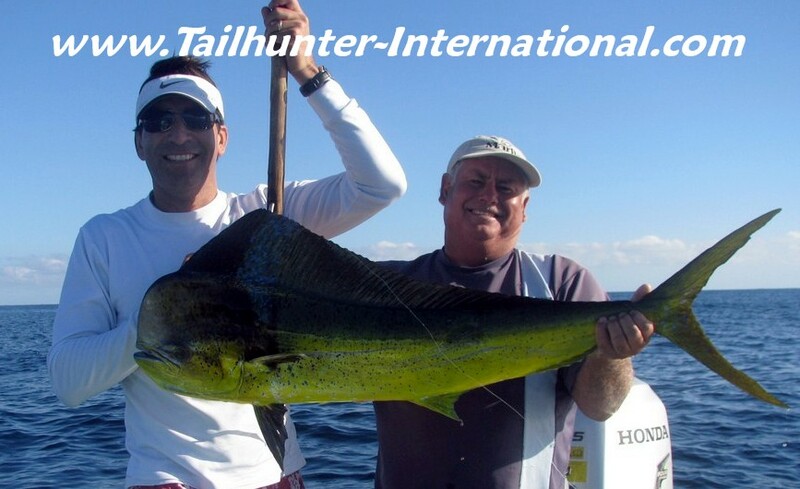 The big jacks are cooler water fish so don’t count on catching yellowtail at the same time as dorado and tuna. It’s not impossible, just not real likely! 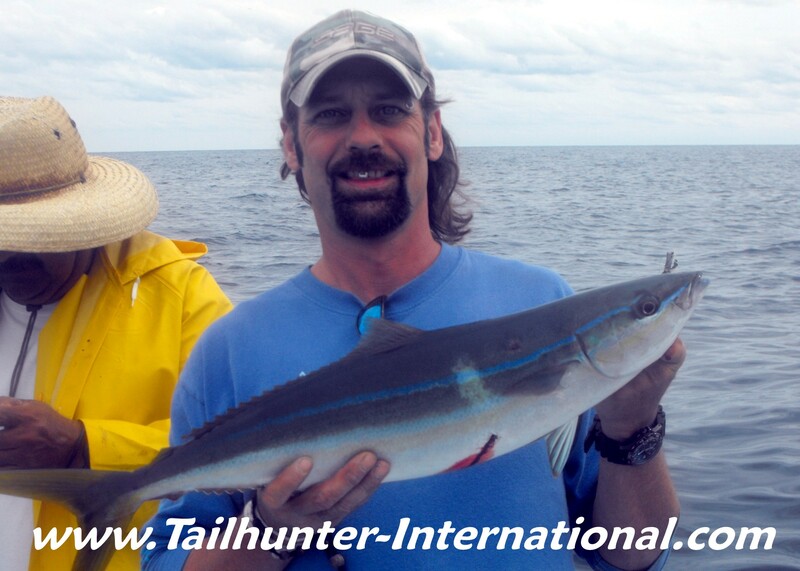 But yellowtail are brutes when they come on strong! We’ll keep you posted. Not many anglers down right now so you get the whole honey hole all to yourself. Live sardines are working best. Highs in the upper 70’s to low 80’s in the day time and a pleasant mid-60’s at night. A great time to be down! Unfortunately, for those of you who belong to the Bloody Decks message boards, we’re no longer able post our fishing reports there but you can still find us on other great sites such as www.senortuna.com ; www.getbentsportfishing.com and www.allcoastsportfishing.com and many others . We’ll miss our Bloody Decks amigos! We enjoyed it and they were always great to us! Lastly…hope everyone had an outstanding Christmas! 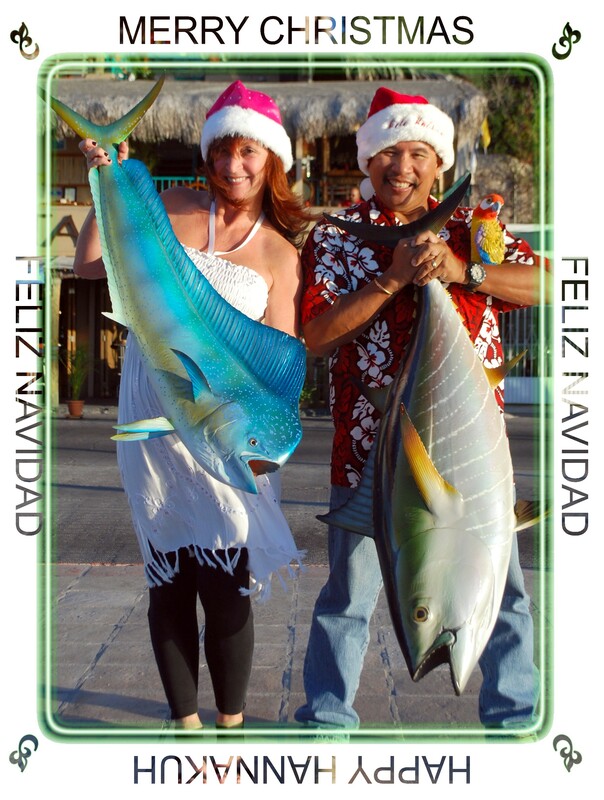 Let’s continue on…Jill and I and all of our Tailhunter Crew and Tribal Members wish all our fish brothers and fish sisters and your families a fantastic New Year for 2011 and we hope to see you in La Paz! From both Jill and I and all of our Tailhunter family here in La Paz from our captains to our drivers and managers as well as our our great folks at our Tailhunter Restaurant, we want to wish you and your family the very best for a peaceful and safe holidays and Christmas. Thanks for being part of our fun adventure and we hope the new year brings all things good! God bless! There's alot of sierra like this beauty that have moved into all kinds of shallow areas around La Paz and especially along the shoals just inside the bay. You definitely don't need to go out far to get into a great bite. Besides using bait, these toothy guys will readily hit flashy, shiny splashy lures like shiny feathers, trolled crank baits and shiny spoons. Thanks to William Boyd for this shot of his fish. No promises during this time of the year, but sure...there's still dorado around. In fact, earlier in the week we had a pretty decent dorado bite that gave way when the winds picked up. But, there are still warm fingers of water around holding these great fish like the one being held by William Boyd. 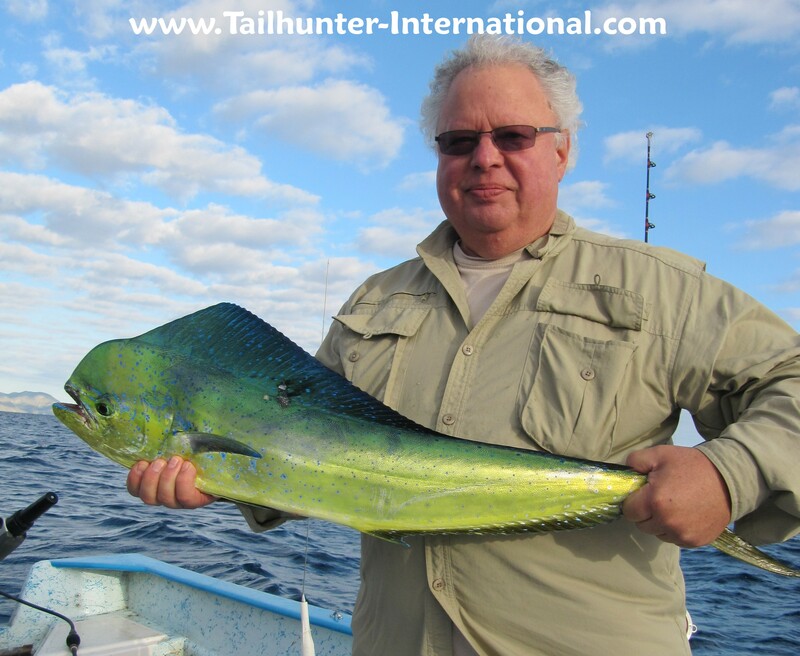 DORADO STILL HOLDING BUT WINDS LATE IN WEEK KEEP ANGLERS CLOSE TO SHORE! For once, this past week was more typical of December fishing. Beautiful sunny weather puntuated some days by some extremely high winds then other days that are completely calm. Just no telling which days will be breezy and which days will be flat…so you just go out and do what you’re gonna do. It’s still going to beat mowing the lawn or sitting in traffic. By the same token, fishing reflected the weather Earlier in the week when the winds were down everyone was surprised by dorado which bit nicely. They were a nice grade of fish as well and not too far from shore with fish up to about 18 pounds. For winter, that’s a decent fish and some of the anglers we had early in the week were fishing with light tackle or with flyrods. So, we had alot of happy folks with tired arms. 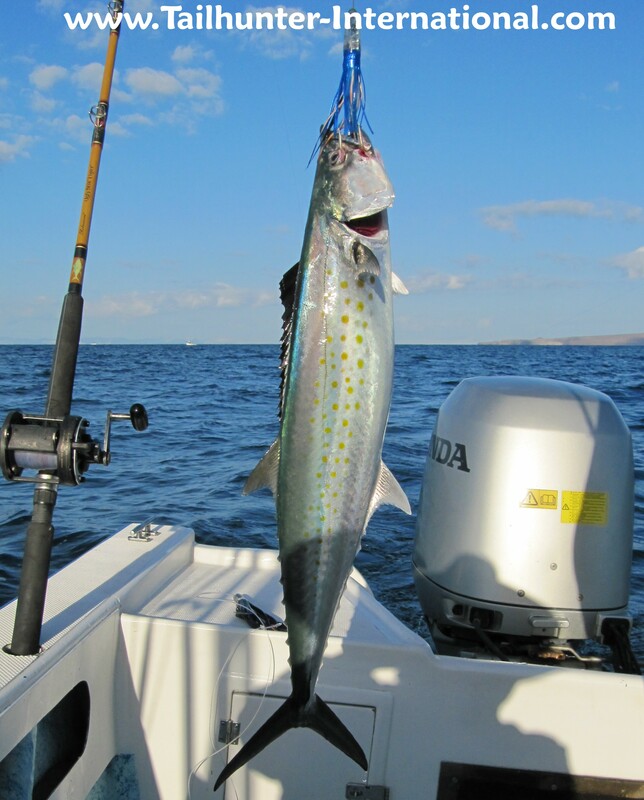 Later in the week, winds came up and the conditions dicated more inshore fishing. Accordingly our catches reflected more sierra, jack crevalle, bonito, snapper and cabrilla. 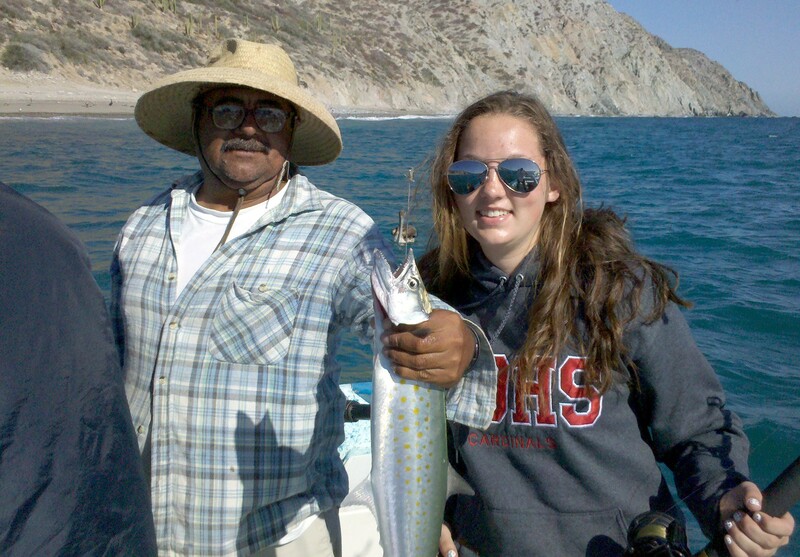 Everything is biting live bait right now so sardines and a good hook are pretty much all you need…except with sierra. Their sharp teeth are best thwarted with a bit of wire leader. That’s our story! Merry Christmas y Feliz Navidad everyone! Sherriff's Officer and good friend from the San Francisco Bay area, Verda Boyd always makes it down for her birthday at the beginning of December and does well. She's holding a trophy-sized sierra here and got limits of the toothy fish...cousins to wahoo...while fishing with our Tailhunter Las Arenas fleet. We try not to get anyone's expectations too high when it comes to the kind of fish they might catch right now especially with the winds blowing, but when the winds are down, there's still some good blue water fishing here as shown by Ed Runyon who poked up some quality dorado fishing with our Tailhunter Las Arenas Fleet. Captain Tim Zimmer is a fishing veteran so he knows all the tricks...like holding his sierra close to the camera to make it look bigger. (The giant hands are the giveaway) Nice try, Tim! 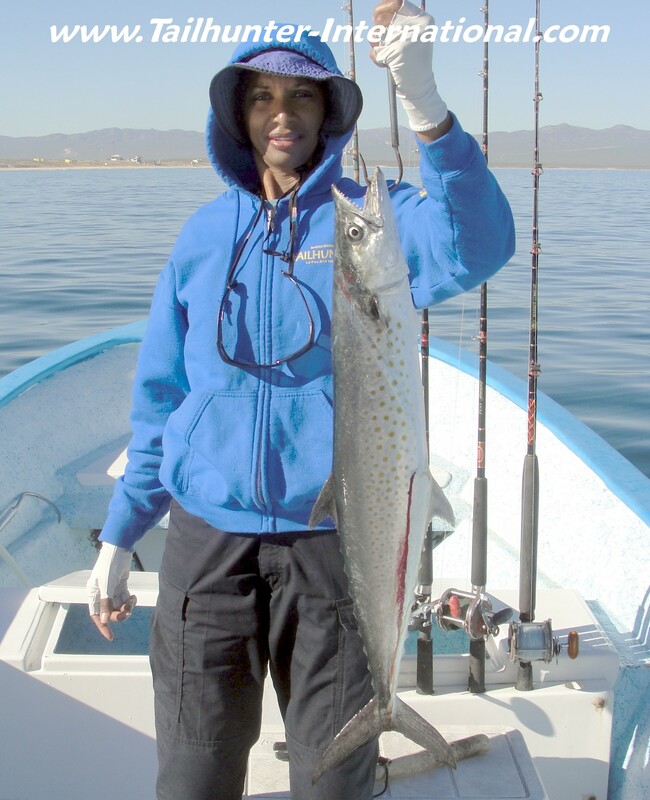 This week was more typical of December fishing in La Paz. Seasonal winds are the biggest variable right now in where we fish ; how we fish and what we catch. But, this is not unusual for winter. If the winds are not blowing, we can fish both our La Paz and our Las Arenas fleets. But, that’s not usually the case and since my crystal ball doesn’t predict winds, we do about ninety percent of our fishing with our Las Arenas fleet. Not only is the fishing closer, but if the winds do kick up, at least we’re not far and generally more protected. Likewise, if the winds aren’t blowing , the waters are still warm enough to fish for pelagic species like dorado, some tuna, wahoo and billfish. 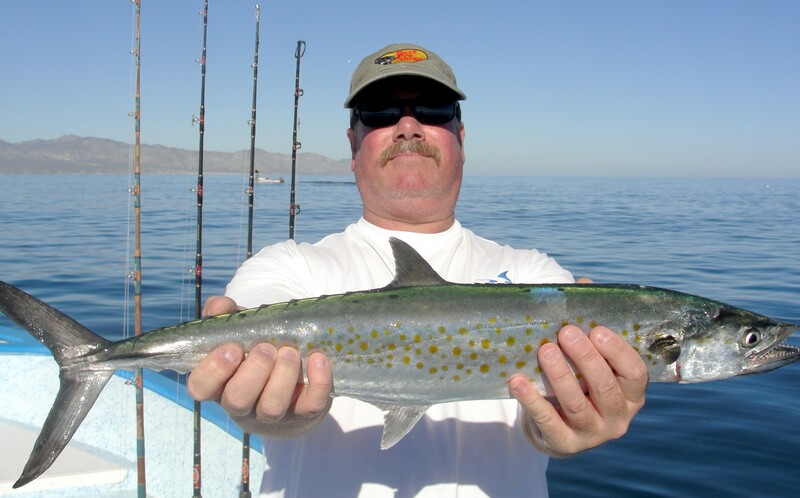 They’re not abundant, but there are still scattered blue-water fish around with dorado being the most prevalent. 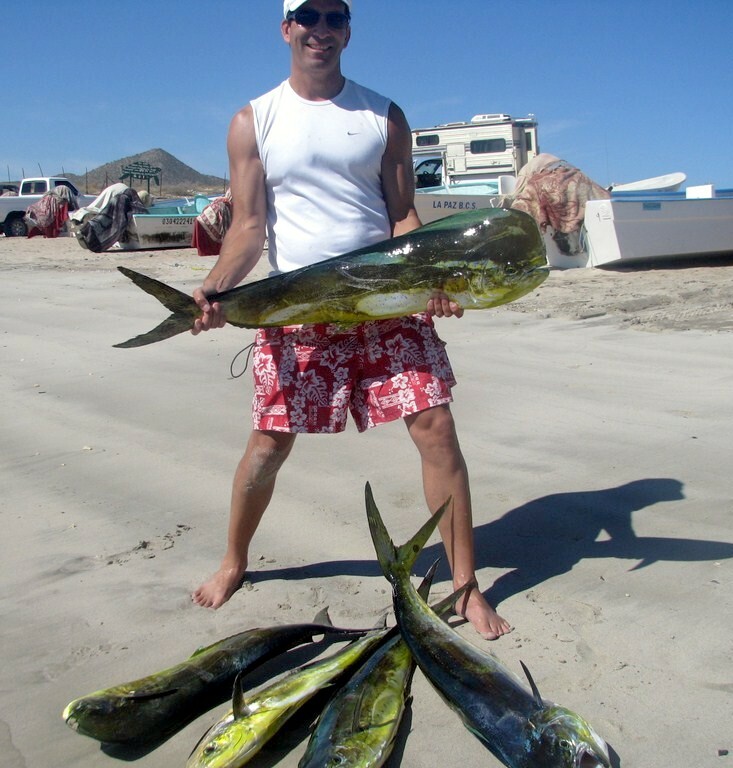 The nice thing about dorado is that they will come close to shore so even if it’s windy, the possibility of nailing a dorado or two while fishing close to shore is not out-of the-question. But, if it’s windy, well…that changes the gameboard. I’d say right now about 3-5 days of the week are blustery. So, we’re fishing inshore for lots of sierra, pargo, snapper, bonito, cabrilla and other species of rock fish. There’s an occasional roosterfish as well. These are not necessarily small fish either. Some of the sierra are 5-8 pounds. Pargo and snapper can be up to 20 pounds. Bonito are…well, bonito…they act about 3 times bigger than they are! Our condolences to the Van Wormer family. Earlier this week, Bobby Van Wormer, the Baja icon who came down when Baja was just a desert smudge as an engineer to fix boat motors and went on to build the East Cape empire that includes Hotel Palmas de Cortez, Playa de Sol and Punta Colorado passed away earlier this week. He had been battling cancer and respiratory problems. Bobby was a giant which is what it takes to survive down here and turn patches of desert into an oasis in the days when there weren’t even roads and electricity. He was a pioneer and one of the first to promote environmental conservation of the fisheries as well. And, for me, he always had a smile and I was privileged to have broken bread with him a time or two. Sadly the end of an era. That’s our story! Stay warm! No matter what time of year, it's a good day when we can get dorado like this beauty taken by Ed Runyon. He and his 10-year-old, son Blake were fishing with our Captain Archangel. There's some great video Ed sent us. Check it out below. What a great combination. A honeymoon and catching dorado for Jessica Henry from Alaska. 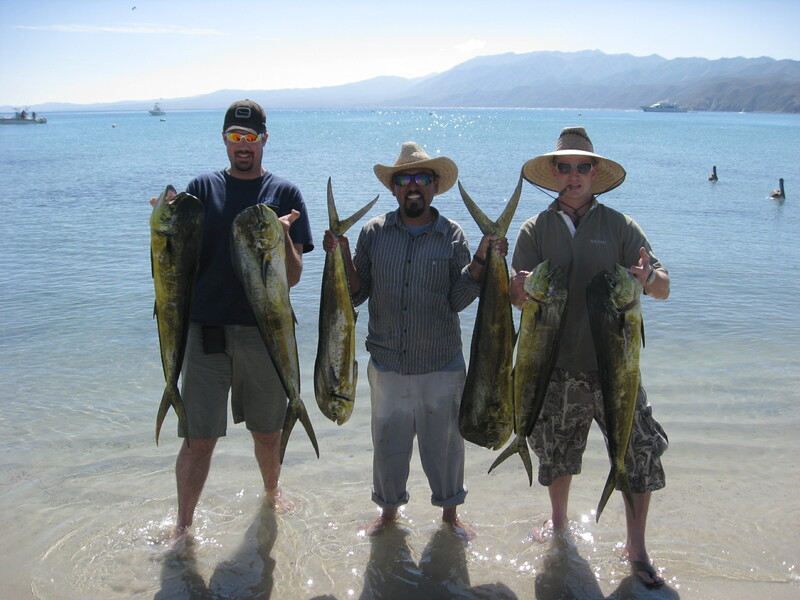 Dorado are still biting, but it's getting cooler and windier these days. Captain Jorge of our Tailhunter Las Arenas Fleet poses with Ryan Orr and Ben Darling after a day of fishing out've Muertos Bay. Both anglers are from Canada. Almost all of our fishing right now is out've Muertos Bay to protect from the northern winds that are becoming more predominant. Darren Henry gets up-close-and-intimate with a bull dorado he caught fishing off Punta Perrico with live bait. It's been an incredible year for swimming with the whalesharks in the bay! I don't think I've ever seen so many in the bay for a good part of the year or we've had so many days when they were just "hanging out!" It's a once-in-a-lifetime experience to get in the water with these gentle giants that can reach 40 or more feet long and are true sharks, but are plankton eaters. That's Don Busse snorkeling in about 10 feet of water in this photo. La Concha Beach Resort is in the background. There's some cool video later on in the fishing report below. Sometimes, it's not just about catching a fish. 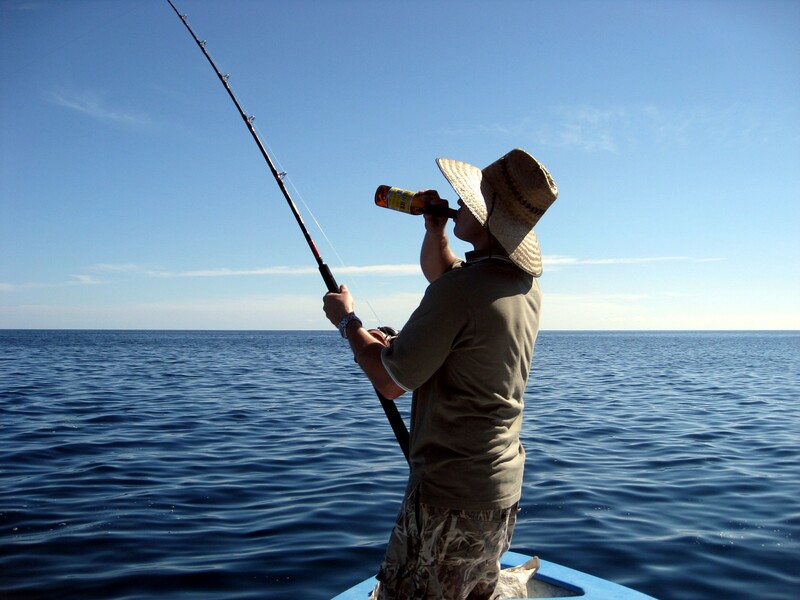 Sometimes it's a cold drink in one hand and a rod in the other on an empty warm ocean! Town isn't very busy right now but more snowbirds are in town escaping colder areas to enjoy some sunshine and get in some beach or watertime. Great time to visit between the holidays. QUIET TIME BETWEEN THE HOLIDAYS BRINGS WARM SUNSHINE AND DORADO! It’s been a quiet week around here after two massive weeks that included the Baja 1000, an Independence weekend celebration and Thanksgiving. I think town is just re-charging and this is that lull before the holiday crowds and more snow-birds descend. It was like that for fishing too. Not many anglers in town. Not much of anyone in town really! It’s a great time to be here. You have everything all to yourself. It was extremely windy earlier in the week. It wasn’t unfishable, but not exactly comfortable. In fact, I told clients who had extra empty days to just hang out around the pool or go shopping and enjoy the sunshine and fish later in the week when winds calmed down. As I said, it wasn’t unfishable, but why get bounced around if you don’t have to? Anyway, much more sierra in the counts which shows that waters are surely cooling. The fish are close and in shallows so you can get into some really nice schools and have yourself a blast. But, as far as bluewater species, there are still fingers of warm water here and there holding dorado and an occasional marlin or wahoo. I’m hoping they linger for a bit. Not sure how far the waters will cool or how fast. 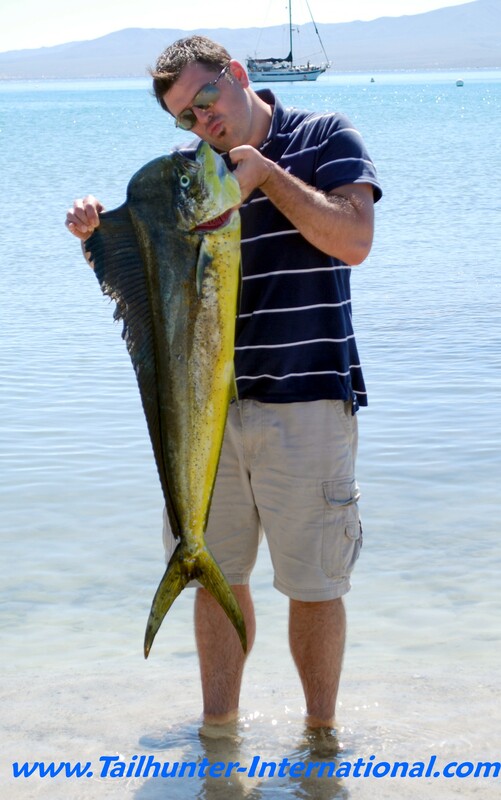 But, for now, no one complains about a nice dorado on the end of their lines with fish up to 20 pounds. On days when it’s too bumpy to be out, the inshore fishing is a great fallback. In addition to the sierra, there’s smaller roosterfish, plus pargo, cabrilla, snapper and jack crevalle. Maybe we’ll start getting some yellowtail and amberjack if the waters go colder. Ed Runyon was good enough to take some great video clips this week. This first one is his son, Blake…10 years old battling his first dorado. You can see they’re just inside of Bahia de Los Muertos. Thanks Ed and congrats to Blake! 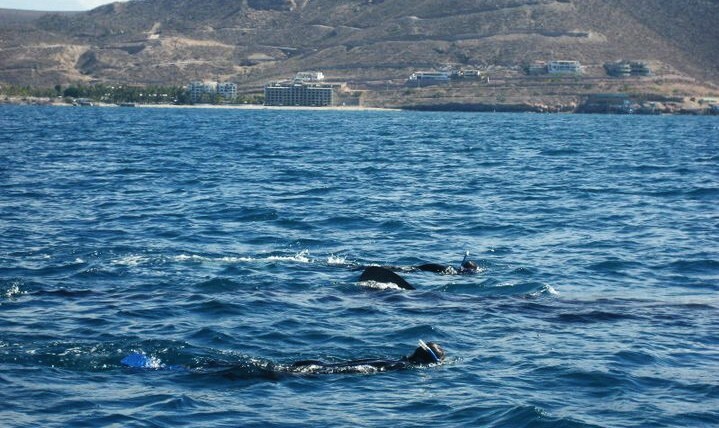 Ed also took this other great clip of his family out to swim with the whalesharks in La Paz Bay. Check out the size of this “baby” whaleshark…ONLY 18 feet long and watch the underwater footage! That’s our story! Have a great week everyone!